How is emissions testing done? The wood combustion process is so complex and the test procedures so difficult, that only a relative handful of people in all of North America fully understand them. for most wood heating appliances, heat output is controlled by restricting combustion air supply which changes the firing rate; emissions and efficiency performance varies with firing rate. The equipment to conduct complete emissions and efficiency tests on a wood stove cost over $100,000 and the procedure usually takes about a week. By comparison, an oil burner mechanic can run an emissions and efficiency test on an oil furnace in about 15 minutes using equipment costing around $500. Both tests have about the same level of overall precision. The wood stove test procedures used today by EPA were developed in the mid-1980s, with the earliest versions first adopted by the State of Oregon. The fuel for emissions testing is Douglas Fir dimensional lumber assembled in a specific configuration for each stove based on firebox shape and volume.The test fuel is Douglas Fir in the form of nominal 2 x 4s for small stoves, 4 x 4s for larger stoves, and a mixture for medium sized fireboxes. The pieces are stapled or nailed together in 'cribs' with spacers made of Douglas Fir 1 x 2s. The precision required in the production of fuel cribs is designed to reduce the variation of test results from one run to the next. A predetermined number of cribs (to fill a specified percentage of firebox volume) is loaded on a live coal bed that is less than 15 percent of the weight of a full wood load. A five minute period is allowed to make adjustments according to the manufacturer's operating instructions, then the combustion air control is set to produce one of four prescribed firing rates. General layout of the emissions test stand using a dilution tunnel.The four firing rates are high (full open air control), medium high, medium low and low. The lowest burn rate is very low; less than one dry kilogram per hour. This test cycle is repeated until there is a record of one valid run in each of the four required burn rates. 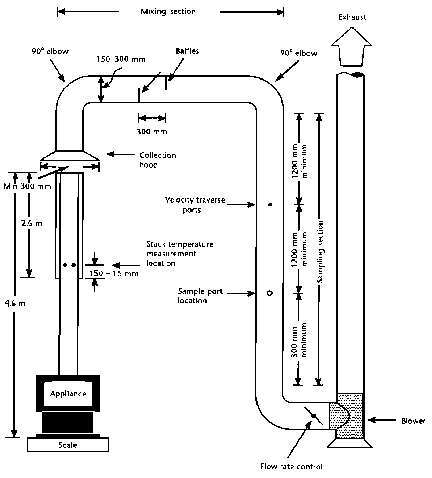 Throughout the testing the exhaust gas is diluted with air according to a prescribed ratio and a sample of the diluted stream is continuously drawn through filters of known weight. The difference in filter weight is used to project total particulate emissions. The results from the four burn rates are averaged and expressed in terms of grams per hour of particulate emissions. Stove makers use one of two main strategies in meeting emissions requirements: catalytic technology or advanced, non-catalytic technology. In a catalyst-equipped stove, the exhaust gas is passed through a ceramic honeycomb element coated with platinum or palladium. Proximity to the catalyst has the effect of lowering the ignition temperature of some components of the smoke. Non-catalytic stoves use firebox insulation, large baffles and pre-heated combustion air supplied strategically around the firebox, typically through perforated pipes, ducts or chambers, to achieve low emissions. The expected degradation in catalyst performance over extended periods prompted regulators to impose a more stringent particulate emission limit for catalytic appliances of 4.1 g/h compared to 7.5 g/h for advanced stoves. Through an exemption for appliances with a burn rate over 5.5 kg/h or a fuel/air ratio in excess of 35:1, decorative fireplaces are not required to comply with the EPA rules. Many pellet stove manufacturers also claim an exemption from emissions certification using the 35:1 air fuel ratio loophole. Wood fired cook stoves and central heating furnaces and boilers were also exempt from the EPA rules for non-technical reasons. While most observers would agree that the EPA test protocol is not perfect, they also acknowledge that the costs of a different test for Canada, which would almost certainly mean different products for Canada and the US, is not justified. The acceptance by Canada of US test results and vice versa is an important objective, in that failure to achieve it would add to the cost of wood burning products.